A delicious and fresh salad made with roasted shrimp, lettuce, avocado, tomatoes, and a homemade lemon tarragon dressing. In a small bowl, add the lemon zest and salt. Mash it into a paste using a pestle or spoon. Transfer the paste to a blender. Add the mustard, honey, lemon juice, wine, and tarragon. Blend on high speed to combine. Slowly pour in the olive oil while blending on low speed. Add additional salt and/or pepper to taste and blend on low speed. Transfer dressing to a serving container. Serve at room temperature. Store leftovers in the refrigerator. Preheat the oven to 375 degrees F. Place the shrimp on a baking sheet and drizzle with olive oil. Season shrimp with salt and pepper. Toss to coat the shrimp evenly with oil. Bake for 5 to 7 minutes until shrimp are cooked through (do not over cook). Allow shrimp to cool to room temperature. Spread the lettuce on a plate or platter. 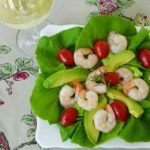 Arrange the cooked shrimp, avocado slices, and tomatoes on top of the lettuce. Sprinkle with green onion slices if using. Drizzle the dressing over the salad. Serve immediately. Quantities of salad ingredients were intentionally left blank. Use your judgement based on the size and number of salads you will be preparing.